Virginia Board of Physical Therapy 10.0 (Type 1)–Please check with your state board for approval as most physical therapy boards will reciprocate approval for continuing education. The American Academy of Health and Fitness (BOC AP#: P3645) is approved by the Board of Certification, Inc. to provide continuing education to Certified Athletic Trainers. This program is eligible for a maximum of 10.00 Category A hours/CEUs. 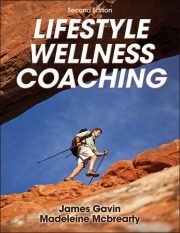 The Fitness Professional’s Guide to Coaching Lifestyle Wellness™ continuing education home study course offered to you in a distant-learning format presents a coaching approach to assisting clients in achieving personal health and wellness behavior changes. The course includes structures for coaching conversations, case studies and practical aids. It further gives communication strategies to motivate, guide, inform, and support clients in realizing personal change. The boundaries of appropriate coaching relationships are addressed, along with the skills for professional development and methodology for supporting clients in change processes related to health, wellness, and fitness. 1. Explain lifestyle wellness coaching and understand what makes coaching effective for increasing a client’s pursuit of healthy lifestyle behaviors. 2. Discuss the evolution of the coaching profession and distinguish lifestyle wellness coaching from other health, wellness and fitness roles. 3. Explain and identify appropriate interventions for the Transtheoretical Model (TTM) and the Learning Through Change (LTC) Model. 4. Describe the flow model of coaching and explain the three areas of focus during the engagement phase and the goal-pursuit phase. 5. Know how to create effective coaching relationships and identify boundaries to the coaching role. 6. Describe the importance of relationship building in the coaching relationship and explain the core components of a solid coaching relationship. 7. Identify and explain nonverbal communication, active listening, verbal and nonverbal encourages and “summarizing” in communications with a coaching client. 8. Discuss open, closed, indirect questions, problematic, and powerful questions; and, the value of questioning in the coaching relationship. 9. Explain the roles of feedback, confrontations, self-disclosure and immediacy in the coaching relationship; along describing the effective use of instruction, information and advice in the coaching relationship. 10. Explain the value of focusing in the process of enhancing awareness and the purposes and processes for utilizing reflections of meaning and interpretations in the coaching relationship. 11. Describe the competency development model and identify the six competencies that clients need. 12. Discuss the importance of action planning, SuPeRSMART goals and goal-setting; plus, identify strategies for managing endings to promote client autonomy, self-efficacy, and the transfer of learning. 13. Explain how the changes generated in coaching for the coach and client are likely to be transformational; and explain the three spheres of the Coach Development Curriculum. Electronic Format – Fitness Professional’s Guide to Coaching Lifestyle Wellness™certificate package with online test includes the eBook version of the 272-page Lifestyle Wellness Coaching, Second Edition by James Gavin and Madeleine Mcbrearty (accessed through Adobe Digital Editions/BlueFire Reader) and a 96-page workbook provided in PDF format. Instructions for completing the multiple-choice online test and obtaining CECs are also included in PDF format. Note: This course package is made available for immediate access and download after purchase. All materials for this electronic format course are available electronically. The information was well-rounded and helpful. I understand the overlap and differences in counseling and coaching. As a CBT oriented counselor, I really enjoyed reading about similar coaching techniques which reinforced what I've come to know in the helping profession! It gave me more perspective and current, solid evidence about tools and strategies to help people be their best selves.. Overall, I thought this was worthwhile. I would also like to add that the admin assist was helpful and friendly with questions I had about accessing the test. I got a response on New Year's Day which I didn't expect. That's going beyond ... thank you! 2017-11-03 05:40:10 ACE Strongly Agree Strongly Agree Strongly Agree By developing the scope of help I can offer to my Personal Training clients. And by pursuing further coaching qualifications.